Dr. Sak Segkhoontod (above photo, centre), President and Chief Executive Officer of the Electronic Government Agency (Public Organization) (EGA), has signed a memorandum of understanding (MOU) on Digital Government Skill Development with two strategic partners, the Office of the Civil Service Commission (OCSC) and the Thailand Professional Qualification Institute (TPQI) last week. This is part of an ambitious goal to stimulate greater development of digital knowledge among government authorities and public officials from operations and management levels. Digital technology is expected to boost strength for Digital Government, and is backed by the development of innovative public services to be provided for people across Thailand. This collaborative action will bring further technical progress to both public and private sectors in accordance with the normative guidelines determined by the Prime Minister, who has recognised the importance of the highest digital competency expected to be upheld by government authorities and public officials. The EGA is directly responsible for the preparation of implementation plans for the development of digital knowledge for government authorities, including the arrangement of extensive training programs, efficient tools, and appropriate techniques to provide the government with a high-quality workforce. Hence, all government authorities will be equipped with both the creativity and means to perform their daily operations and provide quality services for the general public, leading to the accomplishment of Thailand 4.0. Additionally, the EGA has offered concrete support to the development of the IT-based infrastructure required for to equip government authorities and public officials. Such infrastructure has been developed to facilitate the competency evaluation, personnel development, digital learning resources, monitoring and assessment of individuals’ performance, and to create a development database for executives. All aforementioned requirements are required to be reported to the Cabinet for acknowledgement. Mrs. Methinee Thepmanee, Secretary-General of the OCSC, has disclosed that the organization acts as a central agency responsible for the development and management of government authorities and public officials. 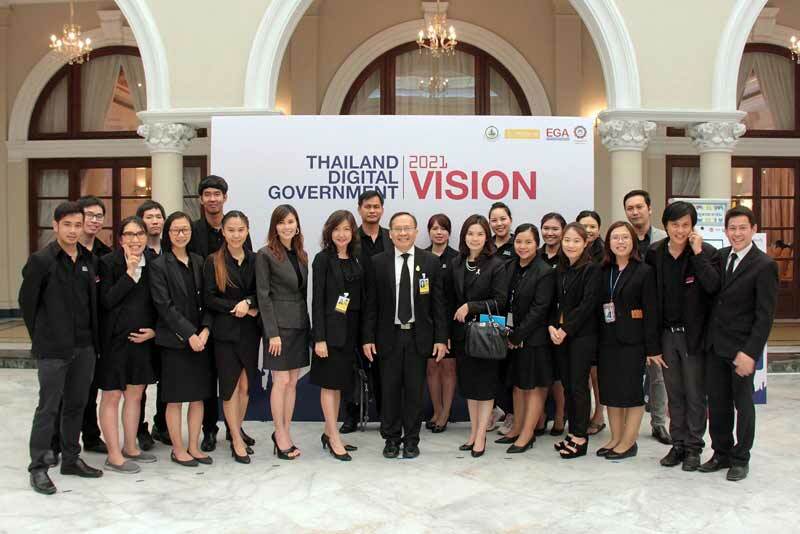 All members of the workforce from the public sector are expected to be ready for technological changes, while also being able to transform the government into Digital Government and move forward with Thailand 4.0. The government skill development plans will be proposed to the OCSC Committee and the Cabinet for further progress accordingly. The main responsibility of the OCSC is to provide efficient analysis for day-to-day operations conducted by government authorities and public officials, determine guidelines for the Digital Government Skill Development, and support government authorities and public officials to possess qualified digital skills to ensure the strategic transformation into Digital Government. Mr. Veera Srikajorn, Director of the TPQI, reveals that the TPQI has offered continuing support to the development of digital performance standards for government authorities and public officials. To increase quality and adequacy of public services to be ready for Thailand 4.0, the assessment will initially be implemented for 15,000 government authorities and public officials expected to be achieved in 2017. Furthermore, the TPQI has managed to boost greater digital knowledge for school and university students, entrepreneurs in the industrial, service, and agricultural sectors, and people in general, aiming to increase the values of educational activities and occupational performances so as to drive growth for Thailand in the most efficient and sustainable way. In the memorandum of understanding, the TPQI’s responsibility is to promote well-developed digital skills of government authorities and public officials conforming to the Development Roadmap approved by the government, prepare examination papers to evaluate digital competency of government authorities and public officials complying with the evolution of Digital Government, and support the acquisition of further digital knowledge among government authorities and public officials. Text via EGA Thailand&apos;s official media release.